When I was growing up, we adopted a stray cat. My older sister immediately proclaimed it to be a girl and named "her" Lucy after the Beatles' song "Lucy in the Sky with Diamonds." It was only after the first trip to the vet that we discovered that Lucy was really a male. Oh well, the name stuck. However, we had no idea what to name our second daughter. Nothing struck a chord until the name Lucy was suggested. On 9.11.89 Lucy Anne was born. Yes, named after an old Tom Cat, but also after Lucy in the Sky with Diamonds. The song has a great deal of magical mystery, legend and myth surrounding it -- including Lucy Sky Diamond = LSD. But, Lucy was a real person -- and she died yesterday after a long fight against lupus. The death of Lucy Vodden at age 46 has been announced by St. Thomas' Hospital in London, where she was treated. John Lennon wrote 'Lucy in the Sky with Diamonds' after his son Julian drew a picture of childhood friend Lucy O'Donnell. The hospital said Monday she died after battling the disease for years. 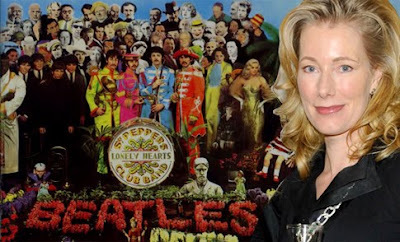 Vodden came to the attention of John Lennon when the Beatles' young son Julian came home from school one day with a drawing that he said was "Lucy in the sky with diamonds." The elder Lennon turned it into a psychedelic masterpiece long associated with LSD use. Julian Lennon reached out to Vodden in recent years as she suffered from the disease. Nice one Booey you clocked that one way before us here. That hasn't appeared on any News Coverage at all here. on second thought tho...they maybe wanted privacy for a few days before the paps get round and camp on the lawn. I often wondered about the "tale" and half of me suspects the incident did happen with the school drawings... but in the heady days when you couldn't be open about drugs or anything for that matter...i just know that Lennon and McCartney would have revelled in making a Code out of L.S.D. Still its sad she was so young. I lost a long time pal yesterday too.... in the USA. She was a 100 yrs old so no real surprises, and actually she hadn't really been compos mentis for the last couple of years... so i'm not shocked or anything. just a little sad, that someone from my life has passed over. Mary was a Great American Character. I met while living in the USA in 1987, an indomitable Serbian journalist who I met on a Greyhound from Washington, one trip... and we stayed friends till the end , in a pen friend sort of way...quite a trick before emails and computers. something, that when they came she never really got into and of course by that time she was in her nineties. I got to know her family quite well, and whenever I went over I would try and find a day spare to go visit them and catch up. Bill , her son-in-law wrote me Monday morning that she finally gave up the ghost at 8.30 our time. She was a huge fund of American History, having arrived from Serbia, from the same village that the great scientist Tesla came from. Her family took her to America with that wave of Refugees during the first World War... and she brought up two daughters, by a fellow Serb called George, who died in 2001, and lived an amazing life, writing Freelance thru some of the most astonishing American History, probably never to see the like again. I tried to encourage her to write it all down and even went as far as making up a huge journal , hand labelled with 90 years of months and weeks in it... ( something that when I did it made me realise just how freaking long 90 years is... ). The idea was that she would write in all the major touchstones of history , and her cameos and comments on it. But as with all these things it came a little late. Still I learned an awful lot from her, and I will miss the cheery drawling southern way she said goodbye on the phone, during the 1990's when she was still a lobbying firebrand down in the political village of Washington DC. Sad news of the real Lucy. Lady A and I were at the Hard Rock Live in Orlando last night and saw the Lennon Room...which is John's apartment from New York set up as it was on the day he was shot. It's off the VIP area of the concert venue. Saw The Decemberists. It was weird, because after touring the place and before the music started I decided to check the blog on my iPhone and read this entry. Lucy in the Sky with Diamonds! Mary sounded like a great lady. My uncle Oran is 90 and full of life and stories, having seen and done many things. It's the world's loss when we lose these natural treasures!